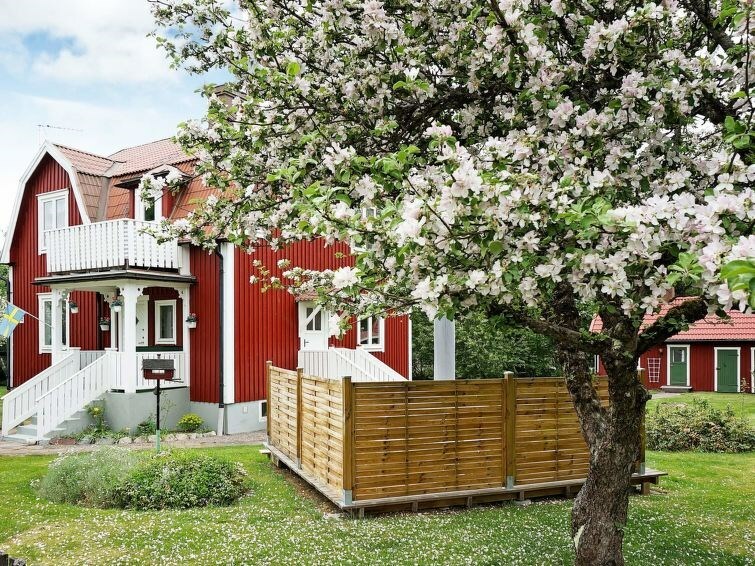 This pretty, traditional holiday home is set on the outskirts of the town of Sandsjöfors. It is only two kilometres from lake Sandsjön and its gorgeous beach, with a diving tower and fishing possibilities. On the first floor of the house, you will find two cosy living rooms, perfect for relaxing and spending time together! One of the living rooms contains a TV and a DVD-player. Please note that the wood burning stoves arent in use. The spacious kitchen features all the amenities you need for cooking delicious meals to enjoy after a day of activities. There are two bathrooms, one with a WC and a washbasin, the other with a WC, a washbasin, and a shower. In the basement theres a washing machine. The bedrooms are on the second floor. Two of the bedrooms have comfortable double beds, and the third bedroom has a bunk bed. You will find a comfortable terrace in the delightful garden, and theres a balcony as well. The cottage is set in the heart of Sweden and there are many great places to visit. The bathing spot by Sandsjön is only two kilometres away and offers child-friendly, shallow water, a bathing dock, and a restaurant. Take a day trip to the Wild West theme park High Chaparall in Värnamo, a great place for families with young children. Vimmerby is another lovely destination for a day trip! The children will really enjoy Astrid Lindgrens World. Katthult and Bullerbyn, well known from Astrid Lindgrens beloved childrens books, are also close. 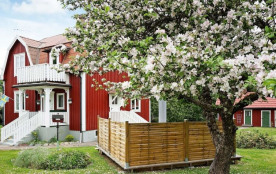 Or why not take a daytrip to Mariannelund and find out how sweets were made in the olden days? The Kingdom of Crystal ( https://www.glasriket.se/en ) is another interesting destination. This is where the famous Kosta Boda glass is made. Welcome to Småland and a lovely summer holiday! Nässjö kommun - 6 pers.